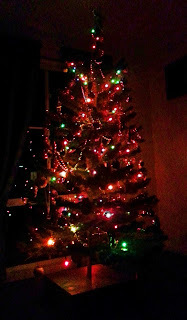 Last Sunday evening, Stuart and I put up our Christmas tree. For me, it's a big event - I absolutely love Christmas! I love all the kitschy decorations, the lights, the corny songs - everything! I still have my vinyl Christmas records that I was given as a child so I drag out my old turntable and play them on repeat as Stu and I pop a bottle of Rica Donna and put up the tree. Through the month of December, I use my Christmas mugs, platters, plates and my Christmas tea-towels, and I even have a little light-up snowman that plugs into my computer and keeps me company while I'm working. It all stems back to my childhood. My family got right into the magic of Christmas and the ceremonial putting-up of the tree. Dad used to assemble the parts, then sit back and watch as Mum and my brother and I did the decorating, then at the last moment, with just the right sense of occasion, he would stand on a chair to sit the angel on the top. There was much rejoicing! Even the dog and cat were excited as my brother and I bounced around counting the number of sleeps and speculating on what Santa would bring. Our tree had the most delicate glass decorations that Dad had treasured since his teens, and the tree, all lit up, was spectacular. One day, my brother and I had a massive sibling brawl beneath the tree. I would have been about ten at the time so Brad would have been about seven, and I've no idea what caused it - probably something trivial - but in the midst of our snarling and tumbling over one another, we bumped the tree. I still recall the horror I felt as the it fell; I can hear the crackly, tinkly sound of fine glass shattering into a million irreparable slivers. All Dad's ornaments were destroyed. More than that, the base of the tree was so damaged, the poor thing couldn't stand up anymore. Dad was devastated. Mum was furious. To remind us of our naughtiness, Mum went out the next day and bought a pile of dreadful, polystyrene made-in-China ornaments. The tree was leaned against the wall and decorated in these el-cheapo nasties. Brad and I learned our lesson in a big way. Fast foward 20 years. I just happened to phone Dad one day to chat about nothing in particular. I said, "What are you up to today?" He replied, "Oh, I've had a big clean up. I've got this trailer-load of junk to take to the tip. Hey you remember my poor old Christmas tree you and Brad wrecked?" I couldn't believe my ears. "You're not taking that to the tip!" Well of course he was, as he explained, it doesn't stand up; has to lean against the wall. It's useless and been in the shed gathering spiders for years. I got to Dad's place so fast I reckon I sprouted wings and flew. I dragged the tree, still in its original box, out of the trailer and stuffed it into the boot of my little car and took it home. When Christmas came around that year, Brad came to my place. 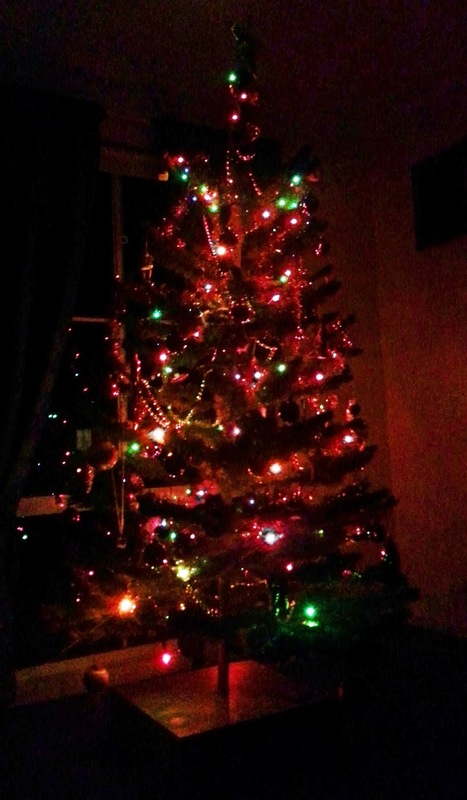 We leaned the tree against a wall and decorated it with the now dusty and faded polystyrene decorations, laughing and swapping stories about what horrible kids we'd been. A few Christmases came and went and by then I was dating Stuart. I put up my poor old tree and decorated it with a few little ornaments I'd bought over the years, but even so, Stu just stared at it finally asking why I had such a decrepit Christmas tree. I explained my sentimental story and instead of laughing at me - as a previous boyfriend had - Stu went back to his place and built a box-like platform for my tree. When he brought it over, we painted it gold and sprinkled glitter on it and finally, after nearly 25 years, the tree stood proudly upright once more - well, nearly upright, but it no longer leans against the wall like an over-refreshed Santa. I think I knew then that Stu was The One! 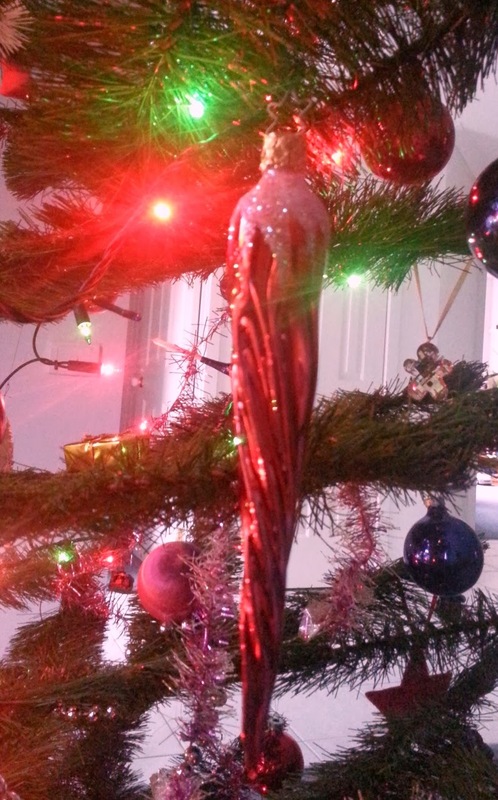 Over the years I've collected some lovely decorations and the tree was looking much recovered. Last year Stu and I were lucky enough to spend Christmas in Germany.We went to the world-famous Christmas markets in Nuremberg and I nearly cried with joy! There, I found the most beautiful decorations, exact replicas of the ones Brad and I had destroyed. 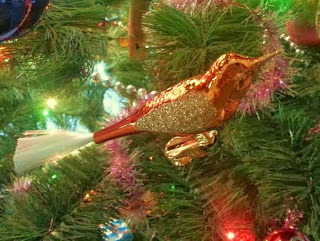 Sweet little birds, spinning glass prisms, frosted baubles and so much more - I could have gone berserk buying all these things. It had been nearly 40 years since my brother and I had broken my Dad's decorations, and I was finally able to replace them. Sadly, my dad passed away five years ago, but I had a quiet word with him while I decorated my tree this year, and I hope that I have atoned for my childish sins. Oh, but I must tell you, that every Christmas no matter what new decorations I might have bought, I always put at least one dreadful polystyrene decoration on the tree and this year will be no exception. 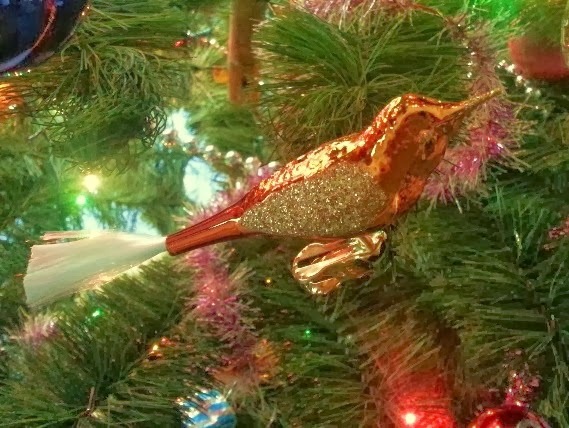 Among all my gorgeous new decorations, I will place just one...Dad would get a kick out of that! And as for me, well yeah, I'm ridiculously sentimental. But that's all part of the magic of Christmas, isn't it!